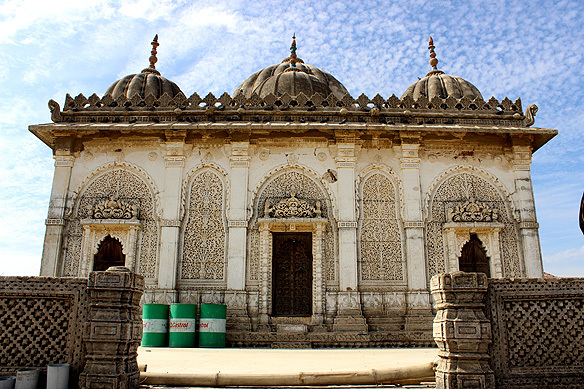 Lakhpat was founded by Rao Lakhpatji (1752-61) the ruler of the State of Kutch. 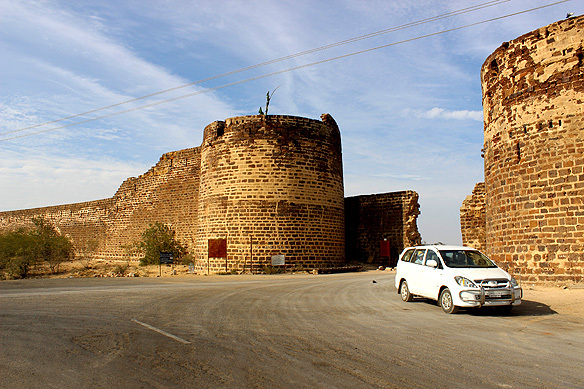 The settlement was later fortified in 1801 by Jamadar Fateh Muhammed, a Kutch General, to defend the kingdom from the Sindhis across the river. The 7 kilometre long fortification, much of which still stands, was at one time manned by 50 Arabs and 150 Kutch soldiers. Within it was a populace of millionaire merchants, predominantly Muslim, with a spattering of Hindus, trading in opium, rice, ghee, silk and perfumes with Sindh. And then, when it was merely half a century old, an earthquake with an estimated magnitude of 7.7 to 8.2 occurred on the evening of 16 June, 1819. And everything changed. The 1819 Rann of Kutch earthquake changed the course of the Indus River on whose banks the town had been built, moving it 150 kilometres away. Lakhpat’s fortunes, as both a port and fertile land, dwindled almost overnight. The town was abandoned to be replaced with thorny acacia trees and dusty desert sands. Where formerly over 10,000 inhabitants had lived in luxury within the fortified walls, the number dropped over the following centuries to a few hundred struggling to subsist. Snuggled within the crumbling fort walls at present are the descendants of the merchants, and a handful of mausoleums that have survived the ravages of nature and time, covered in lattice stone and topped with fairytale domes: Pir Kamalshah Dargah, Ghaus Mohammed no Kubo, and Sayyed Pir no Kubo. 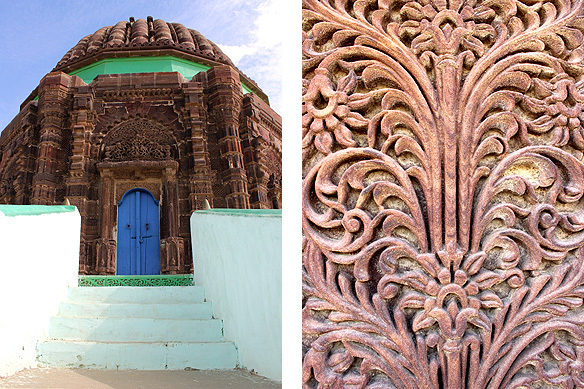 The Pir (Saint) Kamalshah Dargah has a rather fanciful legend to its credit. Pir Kamalshah’s body had been brought to Lakhpat to be buried, as per his wishes, but was refused entry. So he came back to life, lived in Lakhpat for a month, died again and was buried here, as per his wishes. A Shiv mandir (temple) and Gurdwara where Guru Nanak is considered to have camped on his way to Mecca, complete the secularism of Lakhpat. It is late afternoon, and I am starving by now. I walk into the Lakhpat Gurdwara Sahib to pray and feast on the langar. Dal, roti and piping hot sweet tea, served with so much love by the sardarjis doing seva. I found millionaires in Lakhpat today, but of a different kind from their ancestors—millionaires in warmth and generosity. 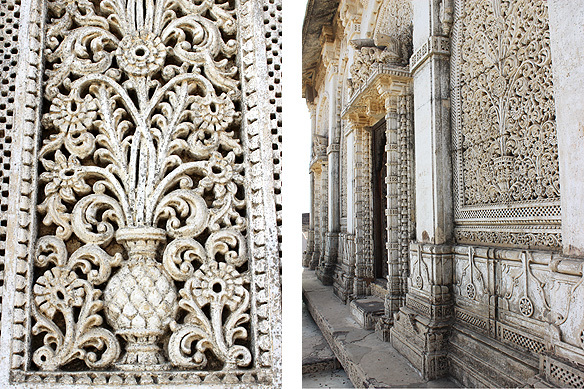 This entry was posted in Exploring India, Gujarat and tagged Breakfree Journeys, Ghaus Mohammed no Kubo, Great Rann of Kutch, Gujarat Tourism, Kori Creek, Kutch, Lakhpat, Lakhpat Gurdwara Sahib, Pir Kamalshah Dargah, Rao Lakhpatji, Refugee, Sayyed Pir no Kubo, The 1819 Rann of Kutch Earthquake by Rama Arya. Bookmark the permalink. Reblogged this on john first light.